AS LOW AS: $91.00/box after mail-in rebate - details below!!! 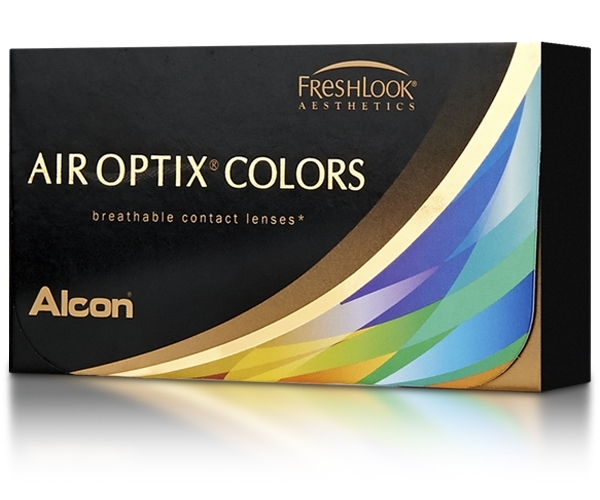 Air Optix Colors is a monthly daily wear lens developed by CIBA Vision. Air Optix Colors lenses feature the new Aqua Moisture System, which includes: a unique moisture agent that helps lubricate the lens for initial comfort, a patented lens material that helps maintain moisture by minimizing the rate of lens dehydration for comfort all day, and an ultra-smooth surface with superior wettability and excellent deposit resistance for comfort every day.Air Optix Aqua lenses are recommended for daily wear or up to six nights of extended wear, as determined by your eye care professional for the optical correction of vision in persons with healthy eyes.These lenses are tinted for ease of handling and will not change the color of your eye. The tint is simply designed to facilitate locating the contact lenses in solution.